The beautiful Love Bridge collection by Thomas Sabo symbolises the special and unbreakable bond between two souls whether they are lovers, best friends or family. 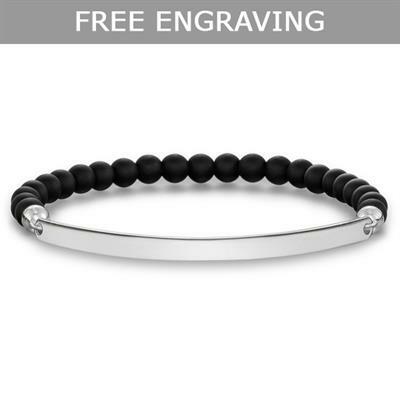 This fabulous bracelet is made with a string of matt black obsidian beads with a 925 Sterling Silver bar. This cool combination is a great way to add some texture to a bracelet stack. Thomas Sabo Love Bridge bracelets can be engraved. Let us know what you'd like to have engraved in the comments box at checkout. This style can fit up to 18 characters.